Basketball: Sunday, Feb. 15 after 12:30 – 12 divisions, both boys and girls are in 4-AA. 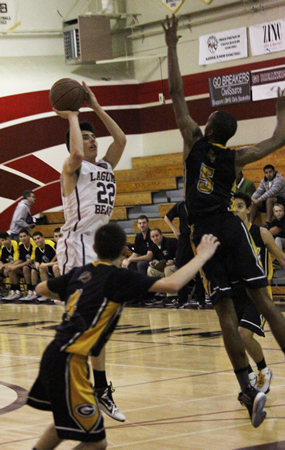 Freshman Blake Burzell scored a team high 20 points in Laguna’s 63-54 home loss to Godinez on Wednesday, Jan. 28. 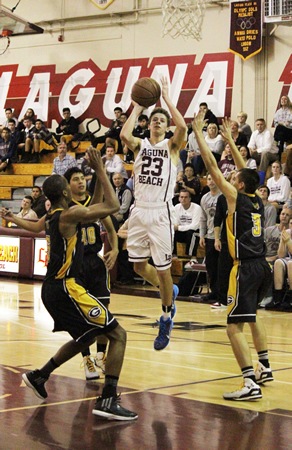 Blake Burzell scored 34 points Friday, Jan. 30, as Laguna ran past Costa Mesa 80-39 in a game played at Dugger Gym. Burzell broke the Laguna freshman season scoring mark of 398 points set by Cheyne Martin in 2004 but fell a point short of the single game mark set by Martin that season against University. Breakers defeated the Mustangs for the 22nd consecutive time. Junior Isaac Wulff looks for an open man at home against Godinez on Wednesday, Jan. 28. Also last week, Laguna could not stop Brandon Smith of Godinez as the league leading Grizzlies outscored Laguna 18-8 in the final quarter to seal a 63-54 victory over the locals. Smith scored 35 points and the visitors appear to be a lock to end Laguna’s eight-year reign on top of the Orange Coast League. The Breakers faced Estancia (2-4, 8-13) this past Wednesday, Jan. 4, and are at Saddleback (1-5, 11-12) on Friday, Feb. 6. The squad closes out league play next week at top ranked Godinez (6-0, 19-4) on Tuesday, Feb. 10 and complete the regular season at home on Thursday, Feb. 12 with Calvary Chapel. 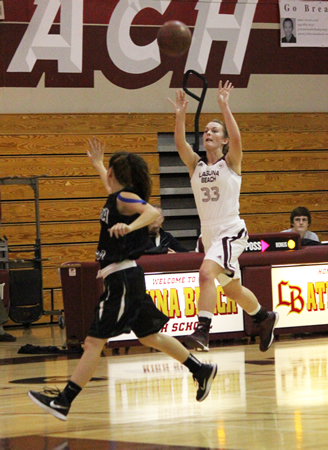 Junior Alexandra Lewis lobs a pass inside during Laguna’s 48-45 home win over Costa Mesa, Thursday, Jan. 29. Girls basketball (13-9) is still in the league title race with a pair of wins last week defeating Godinez 42-31 and Costa Mesa 48-45. Against Mesa on Thursday, Jan. 29, Laguna was down by nine points at the half but Jackie Cenan and Alexandra Lewis led the Breakers to the comeback win over the visitors. 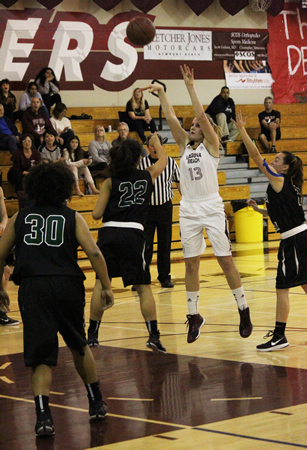 Junior Sydney DeCarlo puts up a shot against Costa Mesa. 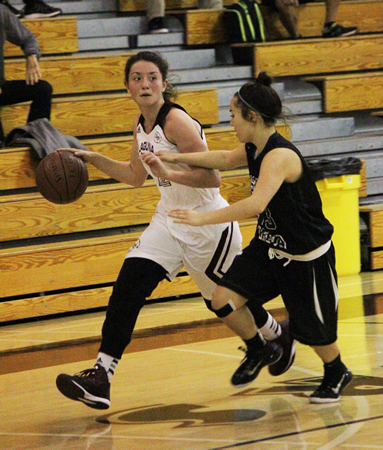 Junior Jackie Cenan drives past a Costa Mesa defender. Breakers last chance for a share of the league crown was this past Tuesday, Feb. 3 when they faced league leading Estancia. Thursday’s game was at Saddleback (1-5, 7-13). Breakers closeout league play next week at Godinez and then finish at home on Wednesday, Feb. 11 with Calvary.